Wanted to run Android 4.0 Ice Cream Sandwich on your laptop/netbook like the Asus Transformer Android Tablet? A brief description for my scenario before setting up dual-booting environment with Android-x86 and Ubuntu. I have Ubuntu 12.04 Precise Pangolin running on my computer and going to dual boot with Android-x86 4.0 RC1 Ice Cream Sandwich. Be sure to read this if you want to dual boot Android-x86 and Microsoft Windows. Install UNetbootin from Ubuntu Software Center. Insert USB Pen Drive and run UNetbootin. Choose Diskimage radio button, then select the Android-x86 ISO. Click OK.
After UNetbootin installed bootloader, click Reboot Now to restart computer. Enter into BIOS and change USB drive to first to boot USB Pen Drive when computer startup. Save the changes and it will restarts again. 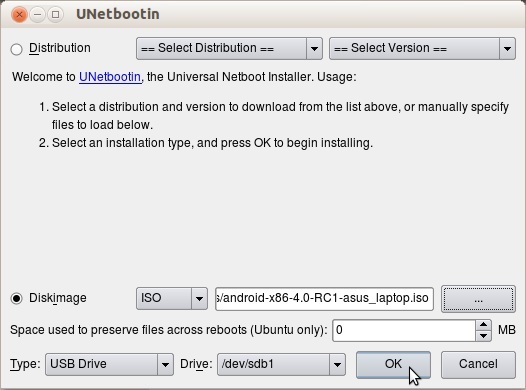 You arrived on the UNetbootin bootloader, choose Installation - Install Android-x86 to harddisk to install Android-x86. Choose the partition to install. You have to know your computer's harddisk partitions well. Example, sda1 = 1st partition, sda2 = 2nd partition, sda3 = 3rd partition, and so on. Select Do not format to keep existing data. Else, choose a filesystem to format. Android-x86 should works on ext2, ext3, fat32 and ntfs. Note that the filesystem must match the partition id. Choose Skip to skip boot loader GRUB installation. 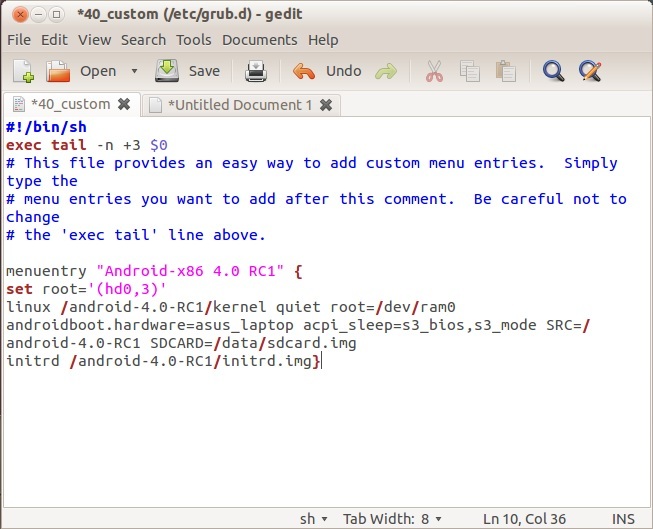 Otherwise, you will have to reinstall GRUB again with Live CD Ubuntu. Choose No, not to let /system be read-write. Choose Yes if it is necessary for you to debug. After Android-x86 installation is completed, it is optional to create a fake SD card. Having a fake SD card you are able to access apps which requires the existence of memory card like Gallery, Music Player, etc. 2046MB is the maximum size for fake SD card. Select Reboot to restart computer. Enter BIOS and change harddisk to boot first. Save and exit. I installed Android x86 on sda3, so I use (hd0,3). For example, if you installed on sda5, change it to (hd0,5). Change asus_laptop to which iso you download. For example, if you're using eeepc iso, change it to eeepc. Remove SDCARD=/data/sdcard.img if didn't create fake SD card. Done. You should be able to dual boot Android-x86 and Ubuntu if you followed the steps above correctly. Note that you have to press and hold Shift key while your computer bootup in order to display GRUB menu. Otherwise, the menu won't shows up. this is very nice review but it says "error: you need to load the kernel first" and it doesnt boot.... what can i do? ?